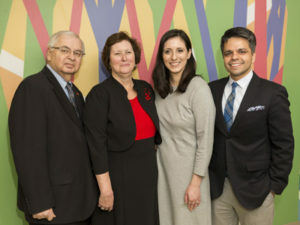 Photo L to R: John Kostic, Treasurer, John E. Kostic Memorial Foundation; Eileen Kostic, President, John E. Kostic Memorial Foundation; Emily Kostic, Vice President, John E. Kostic Memorial Foundation; and Sam Girotra. CAMDEN, NJ— Children’s Regional Hospital at Cooper University Health Care opened a new pediatric outpatient infusion center which was made possible thanks to a $400,000 donation to The Cooper Foundation from the John E. Kostic Memorial Foundation. The new John E. Kostic Pediatric Outpatient Infusion Center will provide family-centered care to children requiring short or long-term infusion therapy, therapeutic injections, or provocative stimulation testing. Infusion therapy will be administered to infants, children, and adolescents who require either one-time or ongoing IV therapy for a variety of acute and chronic illnesses including juvenile diabetes and other endocrine disorders, as well as blood, genetic, and gastrointestinal disorders. Previously, children in need of infusion services had to be admitted on an inpatient unit. Now they will have the convenience in an outpatient setting. Susan Bass Levin, president and chief executive officer of The Cooper Foundation; representatives of the John E. Kostic Memorial Foundation; and representatives of Children’s Regional Hospital at Cooper attended a ribbon cutting ceremony for the new center on February 23, 2018. The space is designed to accommodate one adult caregiver to remain with their child during their treatment, allowing hospital staff to teach and support family-centered care. Treatment times will vary, from as little as 15 minutes up to eight hours depending on the patient’s illness and treatment protocols. “Cooper has always been a center of excellence for children and their families in the region. The foundation is honored to partner with Cooper to continue this tradition through the John E. Kostic Pediatric Outpatient Infusion Center. We are excited to see the impact that this new infusion center will have on South Jersey families, ” said Eileen Kostic, president of the John E. Kostic Memorial Foundation. The John E. Kostic Memorial Foundation was established in 2005 after the untimely death of John E. Kostic, a graduate of Delran High School and a junior at Rider University. The primary mission of the Foundation is to foster scholarships, hospital enrichment programs, and community support programs to effectively meet the needs of today’s children and families. The Foundation makes grants that help private institutions fashion more innovative, cost-effective responses to these needs. In tribute to John, who was diagnosed with juvenile diabetes at age 4, the Foundation is among the largest diabetes scholarship organizations in the state of New Jersey. The Cooper Foundation serves as the philanthropic, community outreach and community development arm of Cooper University Health Care, one of the largest health systems in southern New Jersey with more than 100 outpatient offices and its flagship, Cooper University Hospital located in Camden, N.J. Cooper University Hospital is the premier university hospital serving South Jersey and the Delaware Valley. Cooper has reaffirmed its role as a leader in medical education and research with the opening of Cooper Medical School of Rowan University in 2012, the first four-year allopathic medical school in South Jersey. Cooper is renowned for signature programs in cardiology, cancer, critical care, pediatrics, trauma, orthopaedics, and neurosciences. Cooper is also home to the only state designated children’s hospital in South Jersey—the Children’s Regional Hospital at Cooper. Over the last decade, Cooper has transformed its Camden City neighborhood into the Cooper Health Sciences Campus. In October 2013, the new MD Anderson Cancer Center at Cooper, a freestanding cancer center for comprehensive care, opened on the Health Sciences Campus. Level III Neonatal Intensive Care Unit (NICU) treats full-term and premature infants with medical and surgical problems related to premature birth, respiratory, metabolic, or birth disorders. Only hospital-based pediatric surgery program in South Jersey. The only Pediatric Trauma Center in South Jersey verified by the American College of Surgeons as meeting 229 rigorous standards for providing the most advanced life-saving measures for children in need of trauma care. Renowned Pediatric Emergency Department with fellowship-trained physicians, and distinct waiting areas and rooms specifically designed to meet the needs of infants and children. Academic medical center with the largest pediatric teaching program in South Jersey. That is really cool that they opened a pediatric outpatient infusion center. That sounds like something that every hospital would want to have for themselves. That way they could help kids around the region to the best of their abilities.